Weekend Update and the Giveaway Winner! Happy Monday! I hope you all had a wonderful weekend. My family and I spent a few days at my parent’s home in Wyoming. We were celebrating my younger sister’s wedding! It was a special day and a fabulous event. 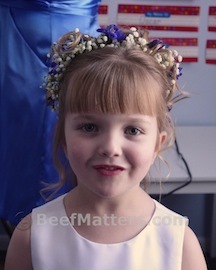 I had a very important job for the big day: Mother of the Flower Girl. This may not seem like a job of crucial importance, indeed it does not carry the same level of responsibility (stress) that the Mother of the Bride assumes. But don’t underestimate the importance of making sure the Flower Girl is well rested, well fed and doesn’t lose the basket of petals before the ceremony begins. Plus the stress of keeping her dress clean for the entire afternoon and evening? Now let’s talk about the iPad that is waiting for a new home! Thank you for the great responses in telling me what technology you absolutely cannot imagine living without. Your answers ranged from indoor plumbing to cameras to internet access to smart phones. My husband and I were discussing what form of technology we use on the ranch that we could not imagine living without. We agreed it is the combustible engine. Operating the ranch without tractors, pick-ups, swathers or backhoes… that would be a LOT of work! Today’s winner was chosen at random (my three year old selected one of the comments that I printed, cut into strips and threw in a basket) from the comments on the blog and on Facebook. The winner is: Trish! Trish’s comment: My laptop. I got a chance to try an ipad and loved it but have not been able to buy one. I don’t know what I would do if I could not read blogs.